"The wine is already in the grape". As soon as they arrive at the "Hugel" premises in the heart of Riquewihr, the grapes are classified according to precise and strict criteria of quality. The presses are filled by gravity, not by pumping. After slow crushing, only the first part of the juice is conserved to merit the famous yellow label. The individuality of each grape variety and of each level of quality is respected. Certain vintages, judged insufficiently distinguished, are partly or wholly eliminated and sold off in bulk to other growers. 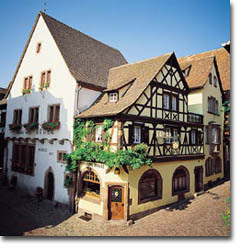 Almost all the "Hugel" cellars are situated below well-preserved XVIth century buildings. The cellars contain oak casks more than one century old, including the famous STE CATERINE, dated 1715, which is featured in the Guinness Book of Records. Such tradition, however, does not exclude innovation : temperature control during fermentation and robotised palletisation at bottling are also present. Each wine is supervised by individual members of the family at every stage of its development. After bottling, it is cellared for at least two years on average, and is labelled just before despatch, after an ultimate quality control. Despite its modest size, the Hugel company enjoys a worldwide reputation. Present in practically every great restaurant in France, almost 80% of "Hugel" wines are exported, to more than 100 countries. The Hugel family was elected by its peers to membership of the "PRIMUM FAMILIAE VINI", an association of 12 family wine companies in the major wine producing regions of the world. It is also a member of the Henokiens, an international association of family businesses that are all more than two hundred years old.